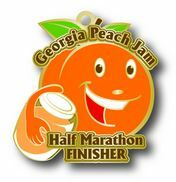 Georgia Peach Jam Half Marathon Race Entry will include a Sweet Custom Dye Cast Finisher Medal, Dri Fit Shirt, Chip Timing, Post Race Recovery Drinks, Fruit and an Awesome Race Day Experience! We are placing a participant cap of 500 participants on this event! AS WITH ALL RACES – NO GUARANTEE OF A T-SHIRT WITH LATE REGISTRATION.